Procambarus clarkii, a freshwater crayfish species native to the US but an invasive pest across Europe. In addition to altering land use and introducing pollutants, people also have an effect on ecosystems through the introduction of new plant and animal life. This often happens by accident, e.g. by boats transporting algae attached to their bottoms, but sometimes it is deliberate in an attempt to change the balance of the ecosystem. It often has catastrophic and long-lasting results. Watch this short video by the Smithsonian Environmental Research Center to find out how humans have accidentally, or deliberately, introduced non-native species, how scientists are tracking them, and how we can do a better job stopping them in the future. It is important to remember the difference between a non-native and an invasive species. Any species that comes from outside is a non-native. It is the harmful ones that scientists call invasive. Invasive non-native species (or INNS) are thought to be the second biggest threat to biodiversity after habitat loss. They have an impact on biodiversity by displacing or preying upon native species, by destroying habitats, or by introducing new diseases or parasites. The most direct implications are the threats of predation on, and competition with, native species. For example, water voles in the UK have declined as a direct result of predation from non-native mink. INNS can also affect ecosystems more widely. 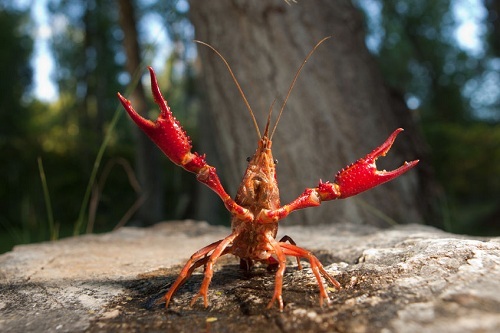 River catchments are particularly vulnerable to invasive aquatic species such as the signal crayfish. Along riverbanks, dense monocultures of plants such as Himalayan balsam and Japanese knotweed can crowd out native species. When these invasive species die down in winter, they leave the river banks bare, exposing them to increased soil erosion. Don’t plant a pest! Check that any plants you buy for your garden are not invasive; ask your local nursery staff for help in identifying invasive plants. Don’t pack a pest when traveling. Be aware that fruits and vegetables, plants, insects and animals can carry pests or become invasive themselves. Don't release aquarium fish and plants, live bait or other exotic animals into the wild. If you plan to own an exotic pet, do your research to make sure you can commit to looking after it. Volunteer at your local park or nature reserve to help remove invasive species. Help educate others about the threat. For more suggestions, and to discover other ways you can have a positive impact on freshwater resources, visit our Taking Action pages. Global Invasive Species Database - search by species, country or habitat.